In this episode we talk about the red headed step child of the Shadowrun RPG Universe Riggers. We discuss what makes a rigger beyond just a fancy ride you need a Rigger Command Console, a Control Rig, and a vehicle with a Rigger Interface. We talk about what a Decker can and can’t do to make a Riggers life hell, as well as the dangers of a Technomancer. We cover how to make the most effective Drone Rigger and why you should always let the Rigger drive. We cover the must have skills and some nasty tricks you can do. We also spend some time talking about the chase combat system and what it means to crash. 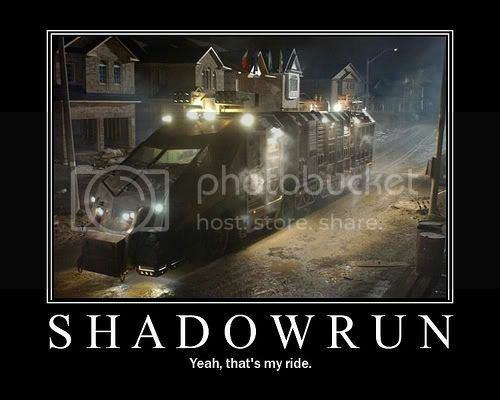 This entry was posted in Podcast Episodes and tagged 4th Edition, 5th Edition, Catalyst Demo Team, Catalyst Game Lab, convention, Crash, Decker, Drone, Dumpshock, Missions, podcast, Rigger, RPG, Shadowrun, Shadowrun Misions, Technomanccer by Tim Patrick. Bookmark the permalink. It might just be me, but where is the audio file? It looks like it’s fixed now, sorry about that. You may need to close your browser and re-turn to the page or clear your cache. Yep all good now, appreciate you fixing it, been hanging for some rigger content! I’ll take a good rigger over a sam any day. On the discussion point about moving your persona between a deck and a control rig implant. I think the intent is for the control rig being connected to the deck or RCC via DNI or PAN, creating a connection between the two. Despite the term “jumping in” the system reads to me more like dragging and dropping a chain of permissions and items together rather than physically moving about. I think this is backed up a bit by the description of the “Jump into rigged device” action, for which you need to already be in VR to access the rigger adaptation on a vehicle or drone. I think of it like a diverted water flow than an unplug-replug. I can see where your coming from on this, and here is the joy of the book…. On page 266 under Take the Jump it says when you jump in your icon replaces or merges with the device icon of the drone. This is the same thing that happens when you form a person by taking control of a deck your icon replaces the device icon to form a persona. Since you can only move your persona between two devices with a reboot this is why we went with the statement you could not truly hack and then jump into some one else’s drones. In the same section it states jumping into a device from AR is a complex action, from VR is a simple, and if your directly connected it is a free action. Of course since a rigger can bend the rules by moving from drone to drone on the same RCC, that leads it to sound like the RCC hosts the Persona and changing drones is just like changing your active gun. The joy of more questions then answers let’s see what others think their is enough grey to go either way on this honestly. Hey guys, thanks so much for the episode. Think I’m finally starting to wrap my head around Riggers. At least jumping in and sending commands to auto-piloting drones. I do have a few questions regarding the Control Device (p.238) action/Remote Controlling your drones. Let me explain my understanding of how this would work, and I will add questions to the relevant sections. From what I understand, when remote controlling drones, you would use the rigger initiative, since you are not sending them commands, but rather fully in control. Thus the drones act when you do. For AR you would use Intuition + Reaction + 1D6, VR would be Data processing + Intuition + 3/4D6 depending on hot or cold sim. Then you get the +1 Bonus in hot sim. Do you still take biofeedback damage if your drones are hit? The amount of your action phase used relates to the complexity of the action. Firing the drones in semi automatic mode will be a simple action, and burst a complex one. Say you use three drones to shoot at two different targets, how would you split your dice pool? And do you roll a full dice pool for each drone if they all shoot at the same target? Finally, what do you roll for drone defence? Since you are using control device it would make most sense to use your reaction + intuition since you are using your skills for gunnery as well, but I am not sure. I think that about covers it, sorry if any of this is unclear. So if I buy a targeting autosoft (similar to a gun skill) of rating 3 for my drone and it’s pilot is 3 (every drone); then that autosoft does nothing to improve the targeting of my drone??? (as they were saying, the pilot takes an automatic rating of 3 on every skill?) Somehow that doesn’t seem right. In other words, I have to buy a autosoft of rating 6 just to raise the attack dice by 3 (from 6 to 9)?